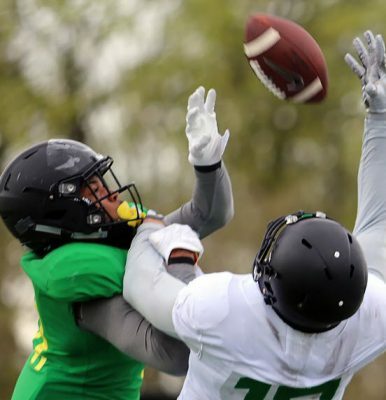 In the previous post, we explained how Jim Leavitt‘s 2-high safety coverage concepts operate for when there are two receivers to a side. Now we will be covering his 2-high safety coverage concepts for when there are 3 receivers to a side, most commonly known as Trips coverages. 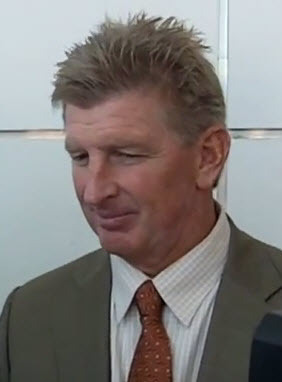 With 2-high safeties, Jim Leavitt will run: (a) Stubbie, and (b) a couple Poach coverages. Problematically, there were a lot of coverage breakdowns (i.e., missed assignments) when facing Trips, and as such, I could not identify another trips coverage than these from 2-high. I suspect then, that Leavitt did not install the entirely of his trips coverages in the 2017 season. The “receiver key” numbering system for defenders. Readers-note the numbering system of receivers by the defense above. This will be helpful as you read this and other analysis articles about coverages. The No. 1 is closest to the sideline and we count up in numbers on each side as we move closer to the center. Note the running back is considered the No. 3 receiver by the defense when counting on the right side for the defense, and the tight end is considered a No. 2 receiver when counting from the sideline inward on the left side. 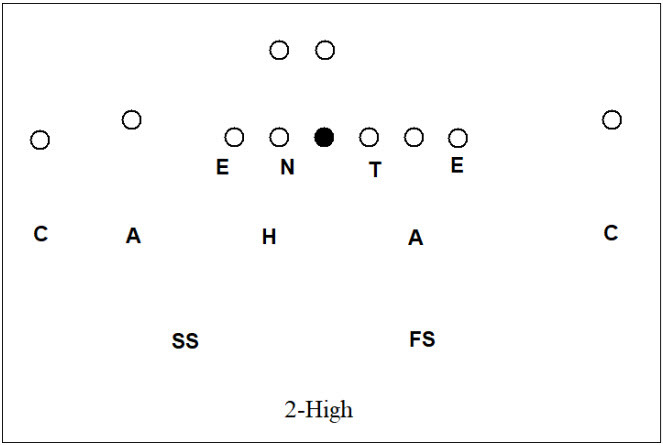 The Apex, (The “A” above on both sides) is the first underneath defender inside the cornerback. This can be the nickel DB, a linebacker, or safety that has rotated down, etc. The point is that the Apex is generally responsible for the No. 2 receiver (second eligible receiver – TE or WR – from the outside in). I use the term Apex because a lot of the same coverages will be the same regardless of who is playing the Apex position, whether it be a linebacker, safety, nickel, or a dime defensive back. I should acknowledge that many coaches use the term Alley for what I will be describing as Apex. The term Hook, (the “H” above) which is the second underneath defender inside the cornerback. This is most commonly a linebacker, but can be a sixth defensive back or a safety rotated down into the box. Again, the point is that a Hook player tends to have run-first responsibility and is generally keying the running back in 2×2 sets. 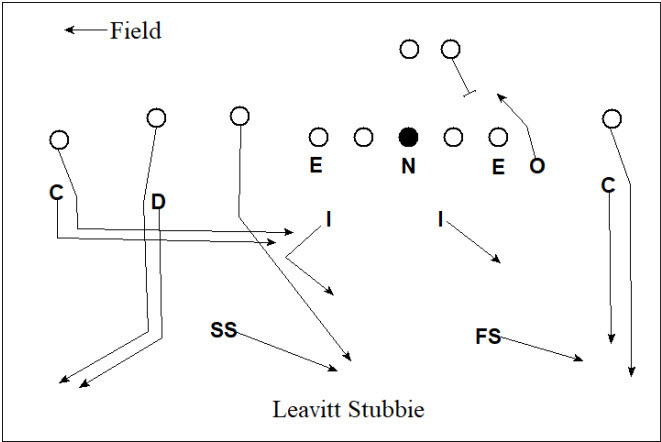 Stubbie, as it is most commonly known, (below) is the most frequent trips coverage from 2-high in football, and Leavitt’s is no exception. Understanding that the least likely man to catch the ball in trips or trey is the outside receiver, defensive coordinators everywhere prefer to lock him down with only man coverage. Then it is effectively 2-Read coverage on the No. 2 and No. 3 receivers. Stubbie coverage means that the corner is man-to-man on the No. 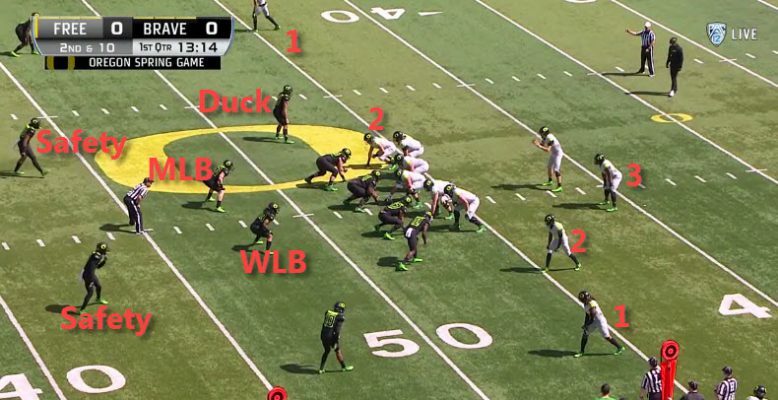 1 receiver, and that the Apex, Hook, and Strong Safety will be playing 2-Read on the No. 2 and No. 3 receivers. Strong Corner – Press alignment. MEG (Man Everywhere he Goes) on No. 1. Strong Apex – Man on No. 2 for everything except when No. 3 is out or No. 2 runs under. If No. 3 is out, then take No. 3 man to man. If No. 2 runs under, then zone off. Hook – If No. 2 or No. 3 runs under, then match that crossing route. Otherwise, wall off the No. 3 from the inside and take him to safety if he goes vertical. Strong Safety – Take all of No. 3 vertical. If No. 3 is not vertical, then take/bracket No. 2 if he is vertical. Weak Apex – Take any No. 2 weak. If no No. 2 weak, then take first crosser. Weak Safety – Bracket any vertical routes by No. 1. If none, push to direction of where the quarterback is looking. Weak Corner – MEG on No. 1. Poach coverages, sometimes called Solo coverages, are a series of related trips coverages that place the free safety in a Poach technique. Essentially, the free safety will work to rob (i.e., try to get an interception on) any passes to the No. 3 if and only if the No. 3 goes vertical. If the No. 3 is not vertical, then the free safety will work to rob any passes to the No. 1 if he is vertical. Poach coverages essentially aim to get the best of all worlds: if No. 3 is vertical, then you get an extra defender in the middle of the field to help there; but if No. 3 is not vertical, then you get an extra defender to help out against the weak No. 1 receiver. One of the benefits of Poach coverages is that it gives the defense flexibility on how they want to play the strong No. 1 and No. 2. 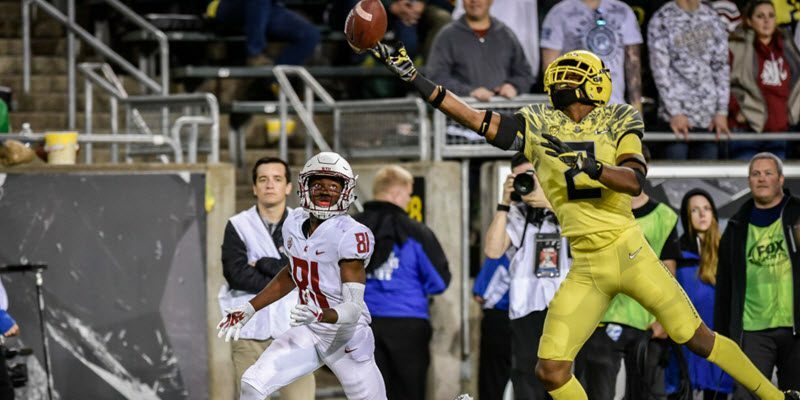 Given that Oregon’s corners will sometimes – though definitely not always – take No. 2 to the flat, I have judged that they have both varieties in their playbook. 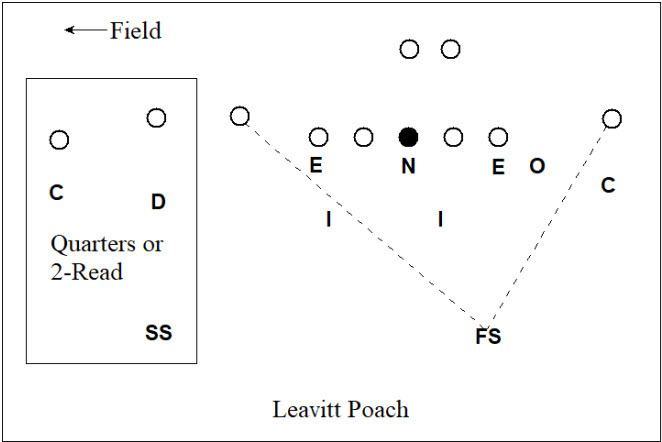 Leavitt seemed to use Poach, however, primarily to free up the weak safety in run support while remaining in 2-high. Strong Corner – Play Quarters or 2-Read on No. 1 and No. 2. Strong Apex – Take first man to the flat. If none, then play Quarters or 2-Read on No. 1 and No. 2. Hook – Man on No. 3 except when No. 3 is out to the flat. If No. 3 is out to the flat, then zone to defend against No. 2. Strong Safety – Play Quarters or 2-Read on No. 1 and No. 2. Weak Safety – Play Poach technique: Rob No. 3 vertical, but if No. 3 is not vertical, then poach No. 1 vertical backside. The above should serve as a brief explanation as to the 2-high trips coverages used by Jim Leavitt in 2017. But as I indicated earlier, I do not believe this is the full extent of 2-high trips coverages Jim Leavitt has in his playbook. I expect to see others in the upcoming 2018 season.